Panic disorder is characterised by repeated panic attacks which happen unpredictably and are not restricted to any particular circumstances. It affects the work and daily living of the patients, causing severe distress. What is a panic attack? What makes a person extremely frightened out of the blue? Can panic disorder be treated? 1. What is a panic attack? 6. How to diagnose and treat Oppositional Defiant Disorder and Conduct Disorder? 1. 1. What is a panic attack? To understand a panic attack, we should know the normal physiological response to stress. When a person faces danger or stress, the body makes responses such as increased breathing rate and heart rate. This prepares the person, physically and psychologically, to cope with the danger and stress. This mechanism is known as a fight-or-flight response. Panic attack occurs when a person, without danger or significant stressor, develops the anxiety symptoms, such as increased heart rate, sweating, trembling hands, chest tightness, abdominal pain and loose stool, numbness in hands and feet, feeling cold or hot, and headache etc. These symptoms come very abruptly, reaching a peak within 10 minutes. 2. How common is panic disorder? The prevalence rate of panic disorder is about 2-6%, with a male to female ratio of 1 to 2. The usual age period of onset is from adolescence to the thirties. Genetic is a very important cause. Among different kinds of anxiety disorders, panic disorder and obsessive compulsive disorder have relative more genetic elements. More than one third of the panic disorder patients also have a family member having panic disorder as well. For environmental risk factor, early traumatic events and parent’s anxiety contribute. Recent medical research found that imbalance of serotonin in brain causes anxiety response happens without real threat and out of control. The patients misunderstand the anxiety symptoms to be something life threatening. For example, the patients misunderstand the increased heart rate as a sign of heart attack, increased breathing as a sign of impending suffocation or going mad. This misunderstanding triggers a vicious cycle, escalating the anxiety symptoms. In severe cases, excessive breathing leads to an abnormally low blood carbon dioxide level and symptoms like numbness and tingling sensation in lips and limbs, dizziness and headache. 4. Can the patient recover from panic disorder? After proper treatment, 70-80% patients with panic disorder can recover. 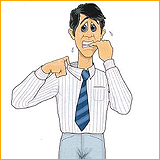 Without treatment, panic disorder can get worse and linger for long time. Both medication and psychological treatment can relieve symptoms and lower the risk of relapse. The patient’s personality and resilience to stress affect the treatment outcome and risk of relapse. Imbalance of serotonin in brain disturbs the normal functioning of the anxiety response. Therefore, to manage the symptoms of panic disorder, doctors use a type of medication which regulates the transmission of serotonin in brain. With proper dosage, most patients will start to improve in 4 to 6 weeks. If the symptoms do not improve despite medications, it might indicate that the dosage has to be further adjusted or that the patients need a bit more time than others to respond to the medication. Patients should not worry too much about an initial delay in treatment response. Because it takes time for the medication to bring out symptoms improvement, at the beginning of treatment, the patient might still have much distress from the symptoms. Therefore, doctors might tranquilizers for a short period of time to relieve the symptoms. Due to the risk of dependence, tranquilizers are for short term use only and the lowest possible dose is prescribed. Tranquilizers should be taken on an as-required basis. Current medications for panic disorder are generally effective and safe. Selective Serotonin Reuptake Inhibitors (SSRI) are the first-line medications which are better tolerated and safer than the previous generation of medications for panic disorder. Some patients might have exacerbation of anxiety symptoms at the first few days of treatment; these symptoms usually subside after a week. Cognitive behavioral therapy is the major kind of psychological treatment for panic disorder. Psychological treatment for panic disorder covers two main areas. First, it increases patient’s knowledge on panic disorder, including the cause of illness and symptoms. This knowledge relieves patients’ misunderstanding which includes the unjustified negative feeling, worry and false assumptions about the illness. Secondly, patients are taught how to handle bodily discomfort and other anxiety symptoms, such as muscle relaxation and regulation of breathing. When a patient is anxious, his breathing becomes rapid and shallow, and disturb the balance of oxygen and carbon dioxide in body. The patient is advised to breathe slowly and adopt diaphragmatic breathing so that breathing becomes deeper and slower and the balance of oxygen and carbon dioxide resumes.